The accidental discovery of a wealth of bones and plant remains preserved in ancient sediments of a high mountain lake in Colorado has opened a window into a past world. These remains add to the already abundant evidence from across North America that not long ago the climate and animals that populated the continent were different than today. Mastodons, mammoths, camels, horses, giant bison and giant sloths roaming the mountainsides of the Rocky Mountains paint a very different picture than what anyone has experienced there for thousands of years. Previously (see: The Snowmastodon Fossil Discovery) we discussed this high alpine reservoir dug out of what used to be a high alpine lake and we observed (See: The Elephants in the Room) that the presence of mammoths and mastodons and sloths in this remote high alpine location is difficult to understand outside the context of an ancient ecosystem developed over tens and hundreds of thousands of years. We saw how an ancient lake has been discovered that it now filled with sediments that have preserved tens of thousands of bones from more than 40 vertebrate animals species. Today we are going to explore this ancient lake a bit further and ask, how did this lake form, how did it fill up and how did all these bones become preserved here? Like the previous post (The Elephants in the Room) we are going to examine this lake by comparing and contrasting two radically different interpretations (conventional science vs young-earth creation science) of the history of this location and North America in general. In doing so we will illustrate the monumental task that young earth creationists face as they attempt to interpret this evidence within their highly restricted timeline of Earth’s history. For those not familiar, young-earth creationists (YECs) presume a literal interpretation of Genesis requires that the Earth was created less than 10,000 years ago, and that a global catastrophic flood destroyed all breathing land-living animals just 4350 years ago. Though not recorded in Scripture, they are convinced that the Earth has experienced a colder climate but they believe there was only a single Ice Age that reached its maximum extent just 4000 years ago. How did this ancient lake form and when? Expected(1) YEC response: the ancient lake was a post-Flood Ice Age lake which formed no more than 4000 years ago. Location, location, location! It’s a beautiful place today but it seems an odd place for a lake to form. I’ve already provided the paleontological reconstruction of the history of the lake in the preceding post (see: The Snowmastodon Fossil Discovery). Multiple dating methods along with common sense calculations of how long would be required to fill a lake basin with sediment and transform it into a meadow provide powerful reasons to believe this lake was first formed more than 100,000 years ago. Evidence gathered at the site points to glaciation as the mechanism for the formation of the lake basin. I expect that most YECs would agree with this conclusion. You might wonder if YECs might simply respond that the lake formed at the end of a global flood rather than after the Flood especially since there are so many fossils preserved in its sediments. However, despite the fact the lake is filled with fossils no YEC is likely to maintain that these fossils were formed by a global flood (2). It is evident that the bottom of the lake is sitting on glacial rock deposits. Therefore, a YEC would assume that this lake was clearly formed after a global flood because glaciers had to form and then deposit material that form the basement material of the lake. In the YEC timeline of Earth history this evidence places the maximum age of this lake at 4350 years but more likely less than 4000 years since a glacier had to extend and retreat from the flanks of the nearby high mountains. Was there more than one Ice Age? YEC response: There was only a single Ice Age and it occurred from roughly 4000 to 4250 years ago. YECs do believe there was an Ice Age. But rather than many Ice Ages spread over many years as geologists have concluded from their observations, they believe there was only a single rapid-onset ice age event, despite no Biblical basis for believing so. This Ice Age is said to have occurred suddenly within a few hundred years after the animals departed Noah’s Ark and then the ice retreated as suddenly, needing only a few hundred years to melt the massive glaciers that had spread over large portions of the earth. This is important because what we observe preserved in this lake is evidence of the presence of many ice age animals but these animals must have migrated to this site well after an Ice Age. This doesn’t fit with the usual YEC story of megafauna extinctions. Generally they propose that animals migrated over the earth before and during a single Ice Age followed by their extinction either because of the Ice Age conditions or the rapid changes that occurred during the retreat of the glaciers. However, we have only identified the tip of the iceberg with respect to the YEC problems created by the Snowmastodon fossils site. The paleobotanical fossils recovered from the sediment column representing the center of the ancient lake, bog and meadow reveal that not long after the lake formed environmental conditions did indeed become warmer. The trees and herbaceous plants present in and around the lake were those that are found at much lower—and warmer—elevations today. This is consistent with a larger body of other evidence that from generally 130,000 to 100,000 years ago the climate was warmer than it is today in western North America. So is has been warmer in Colorado in the past than the increased warmth it is experiencing today. I’m not sure if or why YECs might expect climates to have been warmer than today after the Ice Age and if so why did it then become colder again? Paleoreconstruction of the ancient lake and meadow at different time intervals in the past. 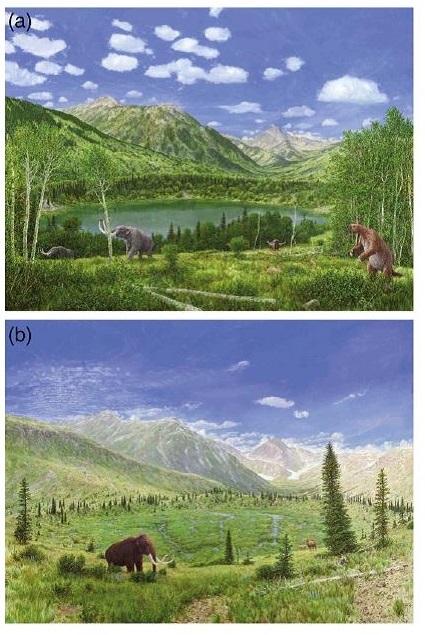 The upper panel represents what it may have looked like over 100,000 years ago while the lower panel represents the meadow that was present less then 75,000 years ago as the environment began to cool heading toward another Ice Age. Figure 6 from Miller et al (2014) -see references. More interestingly though, in the top portions of the lake sediments (i.e. the more recently deposited portions) the preserved plants exhibit a rather rapid change in composition suggesting that the meadow was no longer surrounded by a forest but rather it was surrounded by what today we would find on a high alpine ridge: low-lying, cold-resistant plants. In other words, the fossils from the portions of the sediment record dated to about 75,000 years ago and younger reveal that the climate once again became much colder than it is today. The former warmer climate is called an interglacial period and the latter represents an oncoming Ice Age. That second Ice Age (the Wisconsin Ice Age) did not produce a glacier large enough to cover this high ridge meadow but in the valley below there are younger moraine deposits that attest to this second Ice Age. Evidence of multiple Ice Ages does not sit well with YECs. They are willing to accept evidence that the climate was much colder in the past but they treat all evidence of Ice Age effects as an indication of a single event spread over only a few hundred years. However, here—as found in so many other places on earth—a close examination of the geological record yields clear evidence of multiple Ice Ages separated by times of warmer climates. In this case the lake itself was formed as a result of glaciation during the Illinoin Ice Age from 200,000 to 130,000 years ago followed by much warmer climates that lasted for 15,000 years when the majority of the lake deposits were formed. Sedimentation continued as the climate cooled again leading to the most recent Ice Age called the Wisconsin Ice Age which didn’t peak until 26,500 years ago. It is interesting to note that the fact that an Ice Age of any type occurred in the past is the result of inference from evidence of past actions. YEC call this the product of “historical science.” If historical science points to something that they think could fit into their young-earth chronology they will readily accept the evidence and inferences made from that evidence. Why do they think there was an Ice Age? because there is overwhelming evidence that the climate has been colder in the past. It is not because the Bible tells them there was a post-Flood Ice Age. However, what happens with the same forms of evidence are used to infer that the Earth has experienced multiple Ice Ages. Suddenly the YEC advocate pivots and argues that evidence and the inferences that come from that evidence can’t be trusted because there was no eye-witness. But I don’t see any place in the Bible that says that there was only a single Ice Age not any place that says there could not have been multiple ones. If YECs really believe that ice could cover massive portion of North America in 100-200 years and then melt away in 100-200 years why couldn’t it have happened twice? I would submit that the stubborn clinging to a single “biblical” Ice Age is simple the product of YECs being overwhelmed by evidence that there has been an Ice Age but at the same time realizing that an Ice Age less than 4200 years ago is so implausible that they just can’t proposed there have been multiple Ice Ages despite similar evidence to support that inference. How did this ancient lake fill with sediment in just a few thousand years? YEC response: I would imagine that some YECs will offer the following explanation: possibly, large post-flood, post-Ice Age storms washed large amounts of sediment into the lake quickly filling the basin. These storms might have killed animals around the lake and quickly preserved them. By 3000 years ago the lake was filled with sediment and a bog and meadow formed on top of those sediments. I don’t know how or if YECs will provide an explanation of the origins of this lake and its fossils (2). But I do know there is good reason to believe this lake did not fill by sudden influxes of sediments. Mostly importantly, because the lake sits near the top of a ridge and the area that drains into the lake is small. Even the present reservoir is not expected to experience large changes in water volume because there is no regular source of water input, just intermittent snow and rain. Therefore, there is little source for large amounts of sediment to run into this lake basin. Secondly, the characteristics of the central lake deposits taken from the center of the lake are mudstone and clays with a fair amount or organic content. This is consistent with a lake with little input that is very slowly accumulating material that falls to the lake bottom. It is more than reasonable to suggest that it would take more than 50,000 years to fill this lake in with material based on current influxes and no obvious additional sources of sediment influx in the past. We began by noting that this accidental discovery of a wealth of bones preserved in ancient lake sediments has opened a window into a past world. By observing the location, the material found in the lake and the dating of the layers of material in the lake a picture of a climate that has changed from cold to warm to cold and back to warm is evident. The organisms that inhabited the region surrounding the lake evidently also changed in conjunction with that climate change. These changes occurred on time scales measured in tens of thousands of years. That chronology directly contradicts the extremely compressed chronology of the young-earth paradigm. Can this ancient filled lake and the fossils found preserved in it find any rational explanation within the constraints of the YEC timeline? No! We can confidently conclude that the young-earth assertions about the rate of ecosystem development, massive climate change, rates of sediment deposition, frequency of accidental bone preservation in the lake and many other biological and geological processes are not supported by the many observations made from this mountain ridge in Colorado. 1 Each of the YEC responses I provide are in some sense hypothetical because they are not direct quote or responses to the specific question. The “expected” YEC response refers to the what we would expect a YEC to say if they are consistent with the majority of their own literature on the subject. Miller, Ian M., Jeffrey S. Pigati, R. Scott Anderson, Kirk R. Johnson, Shannon A. Mahan, Thomas A. Ager, Richard G. Baker et al. “Summary of the Snowmastodon Project Special Volume: A high-elevation, multi-proxy biotic and environmental record of MIS 6–4 from the Ziegler Reservoir fossil site, Snowmass Village, Colorado, USA.” Quaternary Research 82, no. 3 (2014): 618-634. Pigati, Jeffrey S., Ian M. Miller, Kirk R. Johnson, Jeffrey S. Honke, Paul E. Carrara, Daniel R. Muhs, Gary Skipp, and Bruce Bryant. 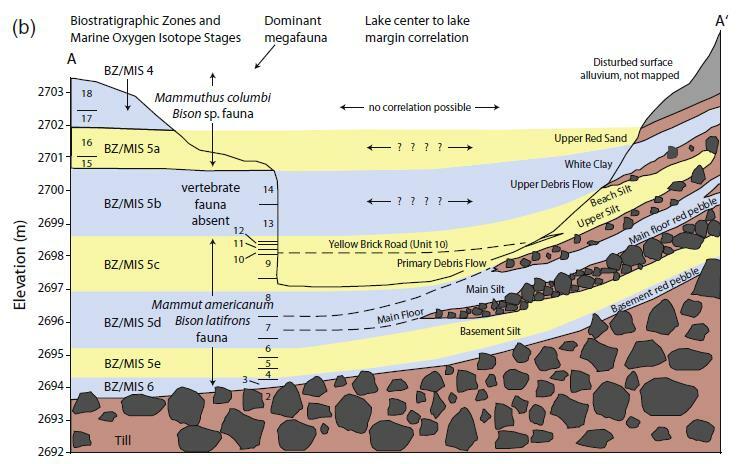 “Geologic setting and stratigraphy of the Ziegler Reservoir fossil site, Snowmass Village, Colorado.” Quaternary Research 82, no. 3 (2014): 477-489. Mahan, Shannon A., Harrison J. Gray, Jeffrey S. Pigati, Jim Wilson, Nathaniel A. Lifton, James B. Paces, and Maarten Blaauw. 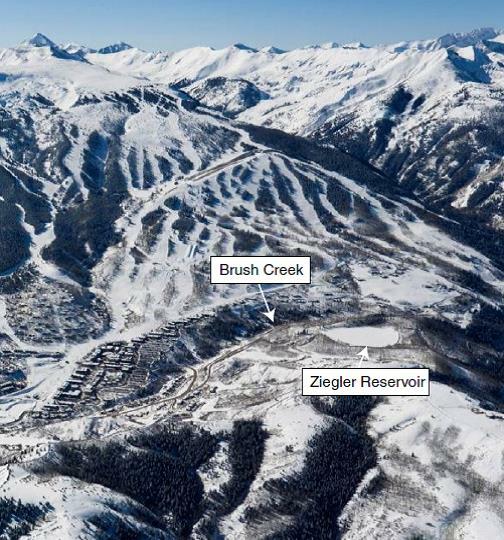 “A geochronologic framework for the Ziegler Reservoir fossil site, Snowmass Village, Colorado.” Quaternary Research 82, no. 3 (2014): 490-503. Fisher, Daniel C., Michael D. Cherney, Cody Newton, Adam N. Rountrey, Zachary T. Calamari, Richard K. Stucky, Carol Lucking, and Lesley Petrie. “Taxonomic overview and tusk growth analyses of Ziegler Reservoir proboscideans.” Quaternary Research 82, no. 3 (2014): 518-532. Strickland, Laura E., Richard G. Baker, Robert S. Thompson, and Dane M. Miller. “Last interglacial plant macrofossils and climates from Ziegler Reservoir, Snowmass Village, Colorado, USA.” Quaternary Research 82, no. 3 (2014): 553-566. “Digging Snowmastodon” is a great coffee-table style book with lots of images and the story of the Snowmasstodon fossil discovery.